If you’re heading out to see the film, which opened in theatres Friday, you want to make sure you’re seeing it in the best possible way. Now that I’ve seen the movie twice, in 70mm IMAX and 70mm film, it became instantly clear Nolan’s sci-fi film should be seen on the biggest screen possible. Friday evening, I headed over to New York City’s Ziegfeld theatre to see the movie on 70mm film. Since Nolan filmed the movie in both 65mm IMAX and 35mm anamorphic film, I figured it only made sense to see it in both IMAX and film before making a decision on the right way to see it. My biggest concern was how the big IMAX scenes would transition over to a smaller screen. There are a few absolutely gorgeous moments when Matthew McConaughey and Anne Hathaway’s characters are blasting through space that I couldn’t imagine looking better in any format other than IMAX. Paramount via HuluYou are literally pulled through space with McConaughey and Hathaway. While I was pleasantly surprised to still feel the pull of being taken through space in 70mm, those scenes felt much more immersive while seeing it in IMAX. You feel like you’re on a ride as you appear to zoom through a wormhole and across an icy planet. Your eyes can’t help but wander up the screen as you feel the enormity of a giant wave on another planet. 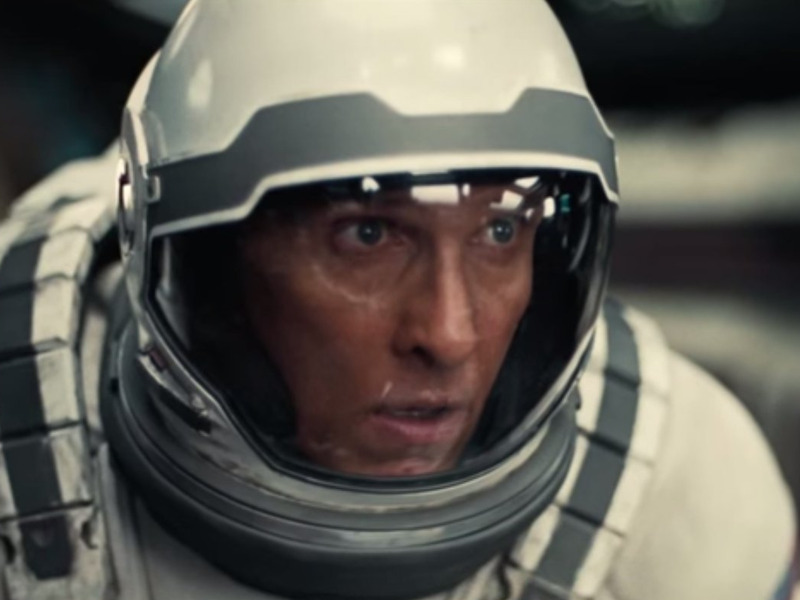 The only problem is that if you want to see “Interstellar” on a legitimate IMAX screen, they are few in the US. As IMAX has become an increasingly popular format, many theatres started retrofitting theatres with smaller IMAX screens that are around 30 feet high. There is only one real IMAX screen in New York City, the AMC Lincoln Square theatre. It’s about a 600-person theatre with a screen that’s 80 feet high and 100 feet wide. If there’s a movie worth seeing in IMAX, that’s the theatre I’ll want to see it at. There is one issue I had seeing the film in 70mm IMAX at AMC’s Lincoln Square. I couldn’t help but think the sound was better at the Ziegfeld in 70mm film. While the sound didn’t appear to distort any of the dialogue during my IMAX screening at Lincoln Square, I did pick up on a few more jokes from a wise-cracking robot named TARS that I missed the first time around. The sound of composer Hans Zimmer’s harrowing soundtrack was less deafening and dynamic in the Ziegfeld. If you’re not a fan of very loud films, 70mm may be the way to go.